While today is Good Friday and the prelude to Easter Sunday for Christians, it is also an important holiday for the Jewish people. Today, Jews celebrate Purim, the holiday in which we, yet again, escaped destruction at the hands of our enemies. In ancient Iran a/k/a Persia, King Xerxes (the king portrayed as some sort of transvestite in “300“) was a might, but not too bright, king who ruled over 127 provinces–the largest kingdom in the world at that time. His top advisor, Haman, did not like the Jews and got the king to sign a decree to destroy them. But in this great story, which is a real-life soap opera, a beautiful woman–the Jew and his Queen, Esther–risked her life and succeeded in overturning that decree. Originally, Xerxes had Vashti as his queen, but she refused to show up at a party the king was holding for all of the men in his kingdom. His advisors warn the king that if he does nothing and allows Queen Vashti’s disobedience to him stand, then news will spread throughout the kingdom and wives throughout the kingdom will disobey their husbands. Because of that, he got rid of her (some say she was beheaded, others say that she was “sent away”), and held a beauty pageant for all of the young virgins in his kingdom. Out of them, he picked Esther as his queen. Her uncle, Mordechai, advised her how to deal with Haman’s plot and decree to kill the Jews, and she confronted Haman in front of the King at a banquet she held for him. The King got angry and sent Haman and his ten sons to the gallows. And he armed the Jewish people to fight for their survival. Can you see why feminists would hate this holiday, and I love it? 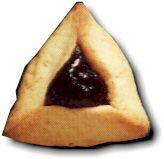 Much more interesting stuff on Purim from my previous writings on the holiday, here and here. Purim is a true story, and, as I’ve noted previously, Queen Esther and Mordechai are buried in Hamadan, Iran, where their tombs were a huge tourist attraction under the Shah of Iran (when Jews could freely travel in and out of Iran without fear). I–and many others–see George W. Bush as the modern day Xerxes. . . not too bright, but very powerful. Sadly, instead of being swayed by a modern-day Esther, he’s been won over by Haman (a combination of Mahmoud Abbas, Condi Clueless, James A. Baker, etc. ), in forcing Israel to construct a terrorist state in its midst and looking the other way as Mahmoud Ahmadinejad arms up. One more year of him and then on to other Xerxes figures, like Barack Hussein Obama. Today, we celebrate Purim (the holiday started at sundown, last night) by hearing the scroll of twice (once, last night and once, this morning). We use noisemakers whenever Haman’s name is read. It is sort of like a mix between Halloween and St. Patrick’s Day, in that kids dress up in costumes and for adults, it is a commandment/a good deed to get so drunk that you can’t tell the difference between the hero, Mordechai, and the villain, Haman, or the Purim story. In addition, we are also commanded to eat a big feast and to give food or money to the poor, as well as baskets of ready-to-eat foods to friends and neighbors. And we eat three-cornered/triangular pastries, meant to resemble the ears of Haman. So, to my Jewish friends and readers, a Happy Purim to you! Thanks to all my readers and friends–Christian, Jewish, and even Druze Arab–who sent me Purim holiday greetings and best wishes. * Read my “Debbie’s Notes” version of the Purim story. * Read the entire Scroll of Esther in English. It’s very entertaining. To my many Christian friends and readers, I respect your religious observances and traditions a great deal. Enjoy your Easter. And, while we have different religions and some different beliefs, we actually have a lot of similar values. To those of you who observe Easter, I am glad you do, because your strong Christian faith is what prevens this country from falling to Islam and becoming another Eurabia (a term coined by author Bat Ye’or and the title of her book). That you have a strong Christian faith is an important bulwark for me as a Jew, so that I can continue to freely practice my faith–and celebrate Purim–in our great country, America. Related: Inventor Spot features the Five Most Tacky Easter Inventions. Happy Purim to you Debbie. I always enjoy coming to your site because I learn so much.Thank you for the explanation of this holiday. God Bless you,Israel and America. Thank you and I look forward to when you celebrate both Easter and Purim. G-d bless you. A blessed Purim to you Debbie,and your family. Happy Purim, Debbie. In Iran, Iraq, Kurdistan, and countries in Central Asia like Uzbekistan, they are celebrating Newroz today, the first day of Spring. It’s no coincidence that all these celebrations occur in the same time frame, they are part and parcel of the influence of Zoroastrianism, the first monotheistic religion, on Chrisitianity and Judaism, and even Islam (Newroz is celebrated mainly in Islamic countries). Happy Purim, Debbie. I went to the glatt kosher grocery to buy hamantashen but all they had were the diabetic ones, so I went to the regular grocery store. They had a hamantashen display, and I got a few, although the chocolate chip ones are a bit goyishe. I was surprised they were almost $1.50 each. That seems like a lot. A happy Purim to you and all Jewish friends, and a happy Easter to all Christian friends. In addition to that, a happy (belated) Holi to all Hindus reading this – I guess with Nowroz, that makes it 4 religions celebrating today (yesterday for the Hindus). I don’t know if the Buddhists have anything running today, but I heard somewhere that most of the world’s religions (not including Islam) have something going on today – a rarity. Nowroz is celebrated by as a part of Persian culture, being as it is Zoroastrian based. The countries where it is celebrated were a part of the pre-Islamic Persian empire, but that doesn’t make it Islamic in and of itself: you don’t see it being celebrated in Pakistan, Saudi Arabia, Egypt or even among the Shia in Lebanon. OTOH, it is celebrated by Zoroastrians in India. Hi Deb, Happy Pruim to you! You may or may not remember me. No matter though, cuz I have a question for you. You seem like a very intelligent, reasonable Jewess and person so I am curious as to your continued faith, Judaism. It is obvious from your posts that your are at least conversationally familiar with Christianity and its tenets as well. So my question is: with all of the Torah prophecy pointing to Jesus a Messiah and Christ, why do you not accept this and profess faith in Him? I wonder if you are like many Jews who have never been truly exposed to the vast amount of Torah prophecy relating to Jesus birth, life, death and resurrection or if you are one who simply denies the validity of said prophecy? I am not asking to attack your faith at all, but because I believe in Jesus as Christ and Messiah. I believe that the question of whether He is or is not should be the central question in the life of every human being, Jews included and I just wonder whether you have ever really done the leg work and research to examine this for yourself. I apologize if this is annoying or something you have been asked a thousand times before, but I am genuinely curious. Just around 50 of the prophecies (out of nearly 500) I refer to are listed on the link provided below. If you have time I would like to hear you answer. Despite the fact the my great-grand father was one of the most famous young talmid-hakkams of the Ukraine and one of the leading experts for the defense in case of M. Beilis (I am not a Jew, I have only one Jewish grandfather who in 1920th converted to Christianity, but I am a friend and very loyal) this marvelous story still makes my heart heavy. I always think – how old were the sons of Haman? How many of them were still children? May be one was still breast-fed? Again – I am the loyalest friend possible, always standing with prosecuted Jews and Israel, but this story makes me really grieving. I am very sorry for this comment out of harmony, but it’ll be worse if I’ll not say about it. As we are now into the “Holy” hours of Jewish tradition you will have to wait till Sunday or Monday if Debbie sees or chooses to respond to your questions. For Jews, the coming of the Messiah by definition brings world peace and perfection of humanity, all that good stuff. This is not currently the state of the world. Therefore, the Messiah has not come yet. The Messiah would be born of a virgin. The Messiah would be both man and God. The Messiah would be resurrected by God. Even ignoring the fact that Jews would consider some major stuff in here to be mistranslations of the Hebrew (The Hebrew word that was translated as “virgin” is “almah” which just means Young Woman), in order to believe that Jesus fits all of these criteria, you have to already believe that the New Testament is factually correct. I do not. As a whole, Jews do not. Unless you can convince me as a skeptic that the New Testament is a divine document, I’m operating under the assumption that it isn’t. But anyway, like I said, there’s still no peace on earth, humans are not perfect yet, so the whole argument is a non-starter. 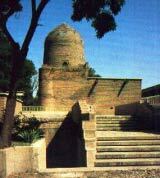 B”H I have heard (unconfirmed) the Hebrew on this tomb is the only Hebrew allowed to be publicly displayed in Iran. Wonder what they’re afraid of? Purim, it is important to note, is a very politically-incorrect holiday. Or at least it is based on a very politically incorrect book in the Bible. Leftist, former member of Kenesset Yossi Sarid YSh”W even suggested at one time that the public reading of the Book of Esther (one of the four main observances of the holiday, along with a festive meal, giving gifts of food to friends, and giving charity to the needy) should be banned. Book-banning in Israel is imminent. Debbie, this is what happens when you try to be nice. They want to reciprocate by sucking the Neshama out of us. Especially true of Easter. It’s all about the Joooooooooz, you know. One thing to live and let live. Another thing to encourage them.